ECD removes metal by non-coontact, electrochemical action, with is fast, highly-selective, and safe. Using a low voltage, direct current, and non-toxic salt electrolytes, burrs are dissolved away is a “reverse plating” action. However, unlike plating, during electrolytic deburring the metal which is removed is converted into fine metal hydroxide particles, which are flushed out of the part by the electrolyte, and can be removed from the electrolyte with filtration. For example, let’s say we are deburring the edges of two intersecting holes. First, a negatively charge electrode (cathode) would be placed into an internal passage of the workpiece, insulated except at it’s tip, which is precisely placed at the intersection of the two holes. The piece is then placed onto a fixture, and is connected to the positive side of the power supply, becoming an anode. Electrolyte is flowed through the workpiece, while the current is turned on for 10 – 30 seconds. Metal is removed at the intersection of the holes, thanks to the electrode’s placement, and is quickly deburred and radiused. With multiple electrodes, multiple intersections can be simultaneously deburred. At the end of the cycle, the current is turned off, electrolyte flow stops, and the part is removed from the fixture. The workpiece is rinsed with water, or with a rust inhibitor solution for mild steel workpieces. In a frequent application: deburring the edges of two intersecting holes, the part would be placed onto a fixture, a negatively charged electrode (cathode) is located into an internal passage of the workpiece. The electrode is insulated except at its tip, which is precisely placed at the intersection of the two holes. The workpiece is connected to the positive side of the power supply and becomes an anode. Electrolyte is flowed through the workpiece and current is turned on for 10 to 30 seconds. Because of the placement of the cathode into the workpiece, the burred edges of the intersecting holes are closest to the conductive tip of the electrode; metal removal is thus focussed at these edges which are quickly deburred and radiused. 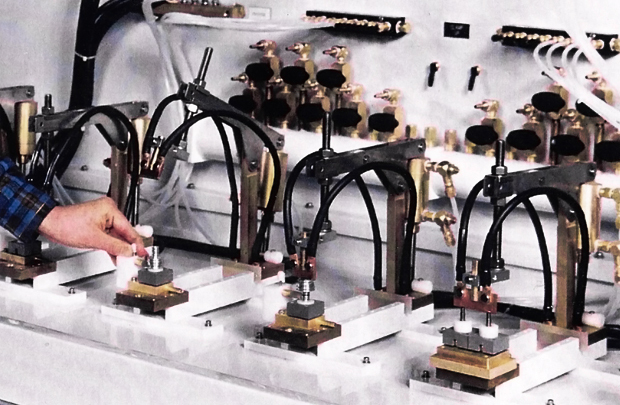 With multiple electrodes, multiple intersections in a workpiece can be simultaneously deburred. At the end of the cycle, the current is turned off, electrolyte flow stops, and the part is removed from the fixture and simply rinsed with water (or with a rust inhibitor solution for mild steel workpieces). 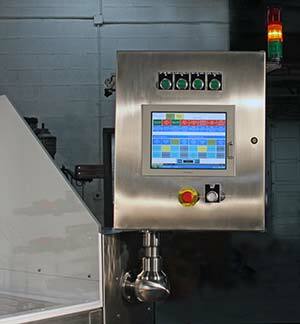 The process involves three principle elements: a fixture, the machine, and the electrolyte. An ECD fixture starts with a base made from a conductive material onto which a workpiece is mounted and precisely located. 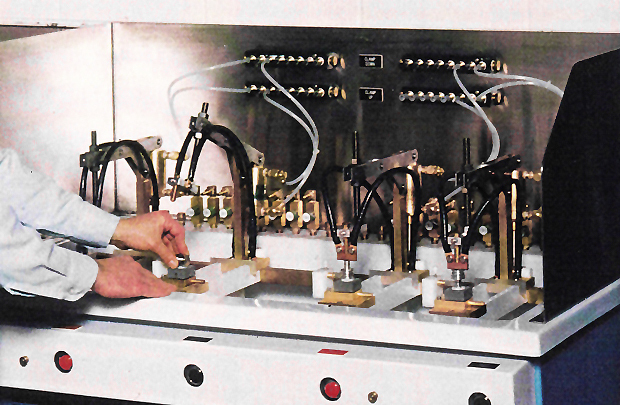 An electrode may be mounted stationary onto the base such that it is correctly positioned relative to the feature being deburred when the part is mounted onto the fixture, or electrodes may be mounted on pneumatically actuated slides and positioned inside the workpiece after it has been located onto the base. Tool design centers around the mask and the electrode. Masks are made from nonconductive material and are bored out to cover the electrode except in the work zone, plus additional space for the flow of electrolyte. The mask can also serve as a locating device for the workpiece. The gap between the electrode and the workpiece at the work zone is usually 0.020 – 0.040 inch (0.5 – 1.0 mm). If the ECD machine’s power supply has a sufficient high current rating, multiple identical fixtures can be mounted onto the worktable and used simultaneously. 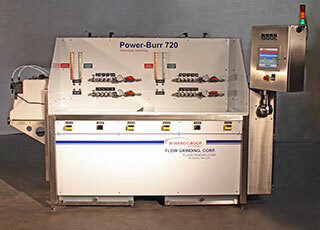 View our specification/description sheets for the Power-Burr 480 and Power-Burr 720 machines. 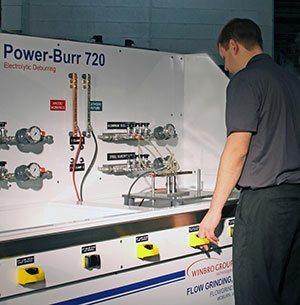 An ECD workstation consists of a frame mounted sink, an electrolyte tank and pumping system, and a DC power supply. A worktable to hold fixtures is mounted in the sink. Backsplashes are located at the rear and sides of the sink. 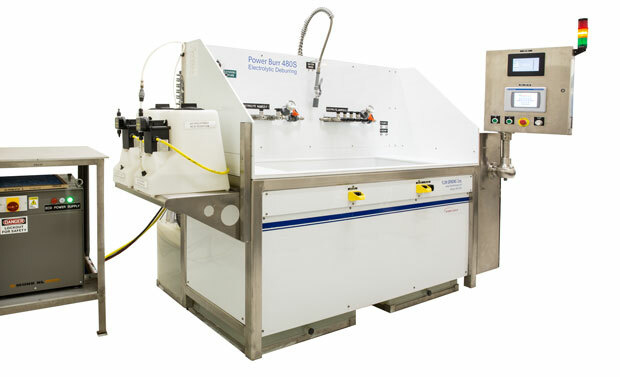 Busbars for electrical current, manifolds for electrolyte, compressed air, and rinse water are mounted onto the backsplash for convenient access. Pneumatic cylinders are frequently used both to clamp the workpiece into the fixture, establishing electrical contact, and also to index electrodes into internal workpiece features. 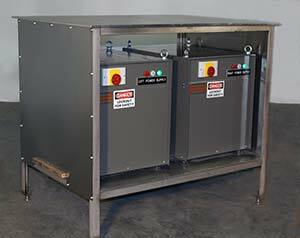 The electrolyte tank is separated by an internal divider into two compartments (for clean and dirty electrolyte) sits under the frame, and has a capacity of approximately 60 gallons. Electrolyte flow is provided by a stainless steel centrifugal pump to a manifold mounted to the frame behind the back splash; flowrates to fixtures are set by individual needle valves. The Power Supply is a 30 VDC switching type power supply and provides excellent quality DC with less than 3% ripple. Pulsed output can be provided down to 50 millisecond pulse width. Power supply cooling can be either by forced air or cooled water. 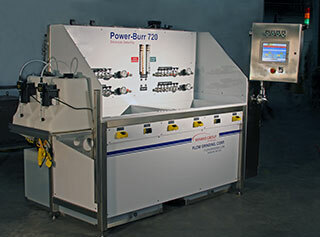 All production ECD machines require an electrolyte filtration system with its own pump; bag filters, filter presses, and, for ultimate electrolyte cleanliness, nanofiltration membrane filters are used. Most machines also include an electrolyte chiller to maintain electrolyte temperature, and an electrolyte Conductivity Monitor & pH Controller to monitor the salt concentration and to maintain the neutral pH of the electrolyte by pumping a mildly acidic solution, such as citric acid solution, into the electrolyte tank. The electrolyte is a simple conductive solution of a salt dissolved in water. The most common electrolytes use sodium chloride or sodium nitrate as the salt. For most applications, we recommend an electrolyte made with 2 pounds of sodium nitrate per gallon of water. Keeping the electrolyte chilled below 70°F (21°C) improves the surface finish in the work zone and reduces the evolution of hydrogen gas (from the formation of metal hydroxides). Some metals, such as titanium, require blends of several salts to achieve the best results. With good filtration, maintaining the correct salt concentration, and pH adjustment, a batch of electrolyte can be used for several months before it needs to be replaced.